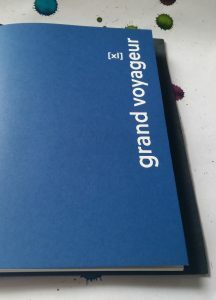 United Inkdom has received a number of Paper Republic Grand Voyager XL traveler’s notebooks for review. 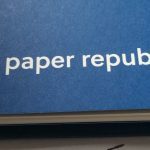 Paper Republic is an Austrian company, based in Vienna, founded in 2012 but their products are starting to make a splash further afield now. Their small team (only four people) have worked hard to produce a high quality product and to keep that quality high. Traveler’s Notebooks (TNs) are enjoying huge popularity at the moment. 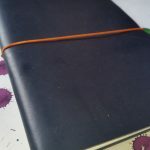 Essentially, a TN is a cover (usually but not always leather) with vertical elastics to hold interchangeable notebooks in place, and a horizontal elastic closure. There are some standard sizes, but also a great deal variation, usually designed to house particular notebooks (such as A5 or Fieldnotes). 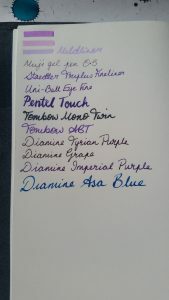 I currently have a standard sized TN made by Ink Bandits on Etsy, and a smaller one which was a gift. The appeal of this system is its adaptability. Covers hold varying numbers of notebooks, but it would be reasonable to expect a cover to hold 3-5 without too much trouble. 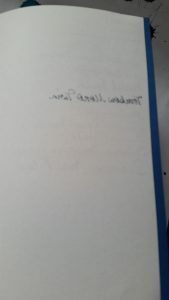 Some wider designs hold more, and of course it depends on the number of pages and paper weight of the notebooks. There are, of course, a huge variety in the inserts available. Etsy is a great source for these. 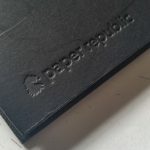 Paper Republic make two sizes of TN: the passport, the and the XL; and a phone case which doubles as a TN. I have road tested the XL, which they sent to me free in exchange for an impartial review. Firstly, the cover. 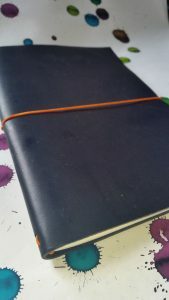 Mine is black leather with contrasting orange elastics (other colours of leather and elastic available). The leather is tanned in Tuscany (a very good pedigree), and is soft and flexible. As with all leathers, it will get scuffed with wear but in such a way as to add character rather than detract from its appearance. I’ve had mine in my bag getting bashed about for a week or so and it’s not looking worn. 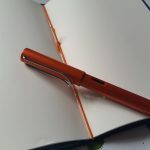 The covers retail at €60 from the manufacturer in Austria (with free shipping for orders over that amount), or £54 from Cult Pens. You can see from the ink tests that the paper stands up to most inks with no feathering or bleed through, and very little shadowing. The biggest issue for me is the sizing. The XL is not actually A5. It’s close, but not close enough. 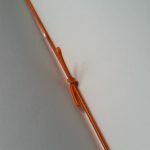 A5 is a standard size: 145m x 210mm. The XL cover is 150mm x 210mm, so it’s a little wider than A5 as you would expect for a cover, though at only an additional 5mm, it’s not really wide enough to accommodate multiple A5 notebooks. That’s not necessarily a problem but the effect of the non-standard sizing is that much of the ability to customise the TN is lost. The inserts, to fit the A5 cover, have to be much smaller than A5: only 135mm x 200mm. 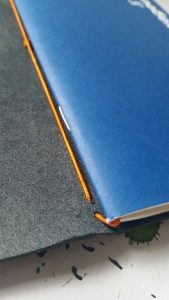 This makes more sense for the narrowness of the cover, but it also means that customers must either buy proprietary sized inserts from Paper Republic or trim down another notebook manually. You could, for example, trim down a large Moleskine Cahier to fit. However, these are expensive notebooks to cut up, and the paper is poorer quality than that of the Paper Republic inserts. You may, understandably, be reluctant to doing that though. Despite the inconvenient proprietary sizing, this is a good TN. The leather is clearly high quality and has a lovely leather smell. 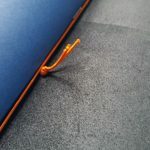 The contrasting elastic colour gives the plain cover some character. I’d probably never have chosen orange but it’s really grown on me.